In recognition of Global Awareness Accessibility Day on May 21, Apple has showcased a series of iOS apps and published a podcast highlighting its efforts to make Apple Watch easy to use for people with disabilities. In its App Store for iOS, Apple has highlighted a series of accessibility leaning tools, apps that make information easy to access (including Instapaper and Overcast) as well as creative and productivity tools (such as Djay 2, Workflow and Voice Dream Writer). The company also hosted a special event presentation, "Apple Watch and Accessibility," a free podcast discussing the assistive technologies and features incorporated into the design of its new watch. 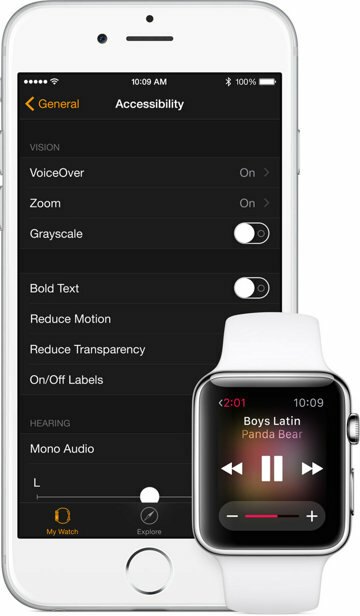 David Woodridge, a blind accessibility technology consultant for Vision Australia, noted that Apple Watch makes extensive use of Apple's award winning VoiceOver technology to make the device accessible to users who are blind or have limited vision, very similar to the VoiceOver experience on iOS. "For me," Woodridge said, "it was a very sequential, linear process on using the Watch out of the box." He added that having Remote features on its wrist with Apple Watch means he no longer has to search for his Apple TV remote or figure out where his two children may have left it last. Alex Jones, who was born deaf, also noted that Apple Watch also allows deaf people to rely on Taptic Engine sensitivity to navigate and to use exercise apps while running, for example. Jones also specifically mentioned Apple Watch's ability to allow deaf users to intimately communicate with others by feeling, as when sending a heartbeat. In April, Apple detailed accessibly features in Apple Watch, which build upon the foundational features built into iOS and in earlier iPods and Macs. The idea for a Global Accessibility Awareness Day began with a collaboration between Joe Devon, a web developer from Los Angeles California, and Jennison Asuncion, an accessibility professional from Toronto, Canada. The GAAD organization they created targets "the design, development, usability, and related communities who build, shape, fund and influence technology and its use," to increase awareness of the importance of making tools, apps and products accessible to everyone. A blog posting earlier today titled "Why making your apps accessible is just the right thing to do," by BlindSquare developer Ilkka Pirttimaa, notes that "285 million people are visually impaired, and 39 million of them are blind. 82% of the visually impaired are 50 years and older," adding that "developing accessible apps is an important contribution to creating a society where everyone can live as long as possible independently and in dignity." "Accessibility is not just an additional feature, but a best-practice"
Pirttimaa cited Apple's documentation on iOS accessibility features, including VoiceOver, observing that "Accessibility is not just an additional feature, but a best-practice." David Niemeijer, the founder and CEO of AssistiveWare, also drew attention to "Global Accessibility Awareness Day and why it matters," in a post on Medium. In it, he observed, "people with a variety of abilities should be able to access the same mainstream technology wherever possible. Companies such as Apple work hard to make their devices and software accessible irrespective of whether the user may have hearing difficulties, vision problems, fine-motor challenges, or, for that matter, small or large hands, thick or thin fingers, or whether they are left or right handed, young or old. They want their products to be usable by the widest possible range of people." 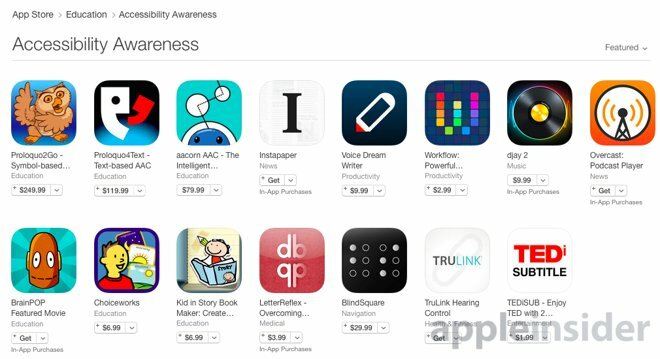 Earlier this month, Apple's VoiceOver technology was slated to be honored with an award from the American Foundation for the Blind for its "success in improving quality of life for people with vision loss through groundbreaking innovation." Last year, Mark A. Riccobono, the president of the National Federation of the Blind, similarly praised the company, noting that "Apple has done more for accessibility than any other company to date, and we have duly recognized this by presenting the company with at least two awards (including our annual Dr. Jacob Bolotin Award) and publicly praising it whenever the opportunity arises."